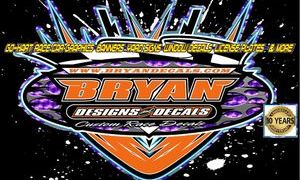 Email: Bryandecals@yahoo.com (Fastest way to reach me) please include a DETAILED email with your project. TEXT- 724.777.5979 Leave me a DETAILED message. Due to the busy rush please read the info below and make sure you follow it to ensure we get your project correct and on time. All PREPAID orders are TOP PRIORITY!!! Proofs will be sent to those customers who have prepaid or made a deposit for an order only to ensure a timely turn around. - Full name, Shipping address, phone number, and email address (proofs will be sent to the one listed). - Color of the car, Colors you want to use, Design ideas. There are many factors that will effect turn around time such as time of the year, art work approval (changes, ect), if we have to order special colors for you, ect.. Most reorders of the EXACT product will take less time then starting from scratch. Estimated times are from 1-5 days for reorders, and 3 days to 2 weeks plus+ on new orders pending the many factors above.. * Turn around time is approximate and may vary throughout the year! January-July are the busiest, so please order ahead of your due date. Payment is due in FULL before production of the order and shipped. This is why we encourage customers to pay in full ahead of time, so there is less likely to be a delay due to not being paid in full, waiting on the payment,, shipping delays, meeting the due date, ect!! Measurements need to be provided for EACH decal (length x width)..Every car is different in each unique way. If you do not provide measurements and something is too big or small, no refunds/exchanges will be given due to not being provided with the correct measurements. If you do not have a particular font(s) in mind to use, please use www.dafont.com and email the font(s) you would like to use. If you don’t have any, then your leavening it up to us to pick them. Since all decals are custom made, no exchanges or refunds are give,.. All sales final. Shipping: Shipping is done USPS Ground (2-11 days) or Priority mail (2-3 days). WE encourage you to choose the best method to suit your time frame.